The purpose of this research is to study the performance of laser ablation propulsion with a numerical method based on computational fluid dynamics (CFD). We focus on the propulsion performance when pulsed laser beam is irradiated on a 10-mm-diameter spherical model. In this paper, 1.3 mm pulsed laser beam and a so-called donut-mode laser beam were both done to validate a simple numerical method without laser ablation model under 10 kPa – 100 kPa ambient pressure. The flow field quantities were solved with three-dimensional Euler equation by finite volume method. 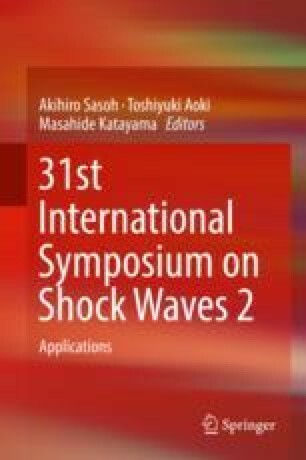 Blast wave energy conversion efficiency ηbw and momentum coupling coefficient Cm were both investigated by comparing between numerical simulation and experiment. Specifically, a so-called explosion source model is used to simplify laser ablation process and estimate blast wave energy conversion efficiency ηbw in this numerical method. Relatively good results of ηbw and Cm are obtained with this method. Finally, results of donut-mode laser beam simulation are presented about blast wave expansion andCm.